South Korean automaker Hyundai is looking to become more competitive with its new fuel cell vehicle, the ix35, and has announced that will be lowering the price of this vehicle. Hyundai’s decision may be based on the growing demand for affordable fuel cell vehicles, as well as the fact that Toyota has released a relatively inexpensive vehicle powered by hydrogen fuel. Hyundai plans to reduce the cost of the ix35 by 43%, which may help it compete with other vehicles that are available in the market. The price cut may further boost the popularity and adoption of the fuel cell vehicle in the company’s home market, South Korea. Many people in the country have become interested in clean transportation, showing favor for battery electric vehicles. Fuel cells have gained some momentum as an alternative to batteries, however, due to their promise of high performance and greater efficiency. The problem, however, is that fuel cells are expensive, which requires automakers like Hyundai to price their fuel cell vehicles appropriately in order to generate profit. Another issue is the lack of a comprehensive hydrogen fuel infrastructure. South Korea only has one hydrogen fuel station that is open to the public. The government does have plans to increase this number to 200 public stations by 2025, however, which could help make fuel cell vehicles more popular. In the United States, the development of a hydrogen infrastructure has been progressive relatively quickly, but the market still lacks the infrastructure needed to adequately support the widespread adoption of fuel cell vehicles. 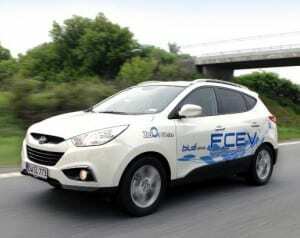 Cutting the cost of Hyundai’s fuel cell vehicle may yield some success in prominent markets. Hyundai is also attracting a great deal of attention to its new vehicle, as it has become a key part in the Hydrogen Transport in European Cities initiative. This project involves bringing hydrogen-based transportation solutions to cities throughout Europe, and the ix35 will be involved in various ventures that are associated with the project.